Dubai City is all about luxury. This jewel like place looms over the desert like a mirage, its gleaming towers home to some of the most opulent shopping malls, cocktail bars and restaurants on earth. At 830m, the city’s Burj Khalifa is the tallest building in the world, with an observation deck offering incredible views for miles around. Where land meets the Persian Gulf you’ll find The Palm - a series of breathtaking artificial islands. Further along the coast is beautiful Jumeirah Beach, where you can bathe in electric blue waters in sight of the iconic Burj Al Arab. Families can enjoy the high octane experiences on offer at two world class waterparks, while couples can partake in some retail therapy or head out for a jaunt in Dubai Desert, which surrounds the city. Camel, 4x4 and hot air balloon rides are among the adventures that await you here. Holidays in Dubai City offer the finest shopping experience in the UAE. At the centre of town is the vast Dubai Mall, the world’s biggest retail and entertainment centre. Alongside 1,300 stores you’ll find a cinema, aquarium, zoo and VR park. As for dining, Dubai City is home to some of the world’s most extraordinary restaurants. From Nathan Outlaw’s remarkable floor to ceiling aquarium to the vibrant local colour of desert outpost Al Hadheerah, you’ll be talking about your evenings out for years to come. Sovereign has more than four decades’ experience in providing bespoke luxury holidays. We’ve thought of everything, from complimentary lounge access in selected UK airports to pairing you with a Trusted Adviser, who remains on hand throughout your trip to ensure everything runs smoothly. For stunning rooms in a chic setting, stay at Conrad, Dubai. Situated in the city’s financial district, this fabulous hotel features a rooftop pool with gardens. Its elegant wine bar and the excellent Ballaro restaurant are among the best in the city, making this the perfect place to unwind after a day’s exploring. Flight time from the UK to Dubai is approximately 6 hours 30 minutes. Transfer time from Dubai airport to Dubai City is approximately 20 minutes. Summers in Dubai are seriously hot – 40°C kind of hot. Although all buildings are air conditioned, outdoor activities can be uncomfortable in this kind of heat, and some may even be closed. November to April is the best time to visit Dubai; rain is scarce, and temperatures stay at a comfortable mid-20s average. 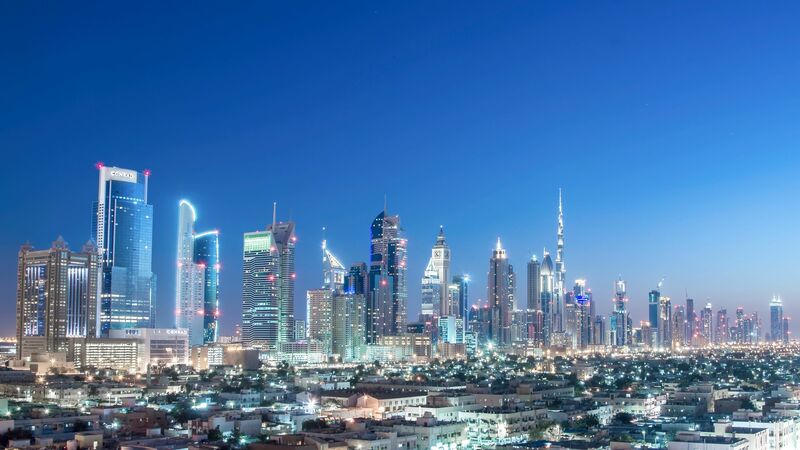 British citizens will be granted a free 30-day visa upon arrival in Dubai. In most tourist destinations in the Emirates (such as Dubai and Ras al Khaimah), it’s customary to leave a 10% cash tip in restaurants. Small tips are appreciated for other services; aim for five to 20 UAE dirhams for porters bringing your bags to your room and for taxi drivers. The official language of Dubai is Arabic. English is widely spoken too, so getting by is easy.